Superintendent Dave Cliff was yesterday presented with a tewhatewha as a message of solidarity from Bay of Plenty colleagues. Mr Cliff has led the Police response to the devastating Christchurch earthquake since it struck last Tuesday. The tewhatewha is a traditional Maori weapon. It signifies authority, strategy, and mobilisation as it was used by leaders in times of trouble to soundlessly signal directions. The gift was carved by master carvers at Te Puia in Rotorua who were approached by Bay of Plenty District Commander Superintendent Glenn Dunbier to select a gift of significance. It is made of rata timber. A carved stand is also being crafted from 3000 year old kauri. The gift was presented to Dave at a team briefing on Saturday, when he said it made him really proud. "This accolade is for the staff. They've been stunning and the hardest part is getting anyone to go home," he said. Note: Mr Cliff is not available to comment further on this story due to other demands. 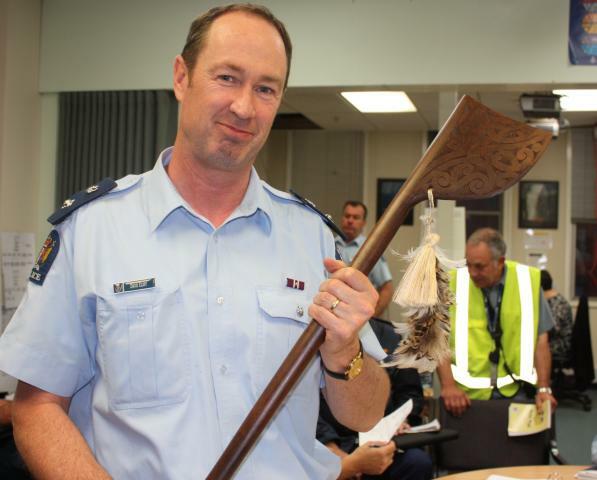 Photo: Superintendent Dave Cliff with a tewhatewha, gifted by Bay of Plenty colleagues.